Description: Hello, my name is Maqueen, is a graphical programming robot for STEM education, which inherits playability and simple operation of micro:bit. 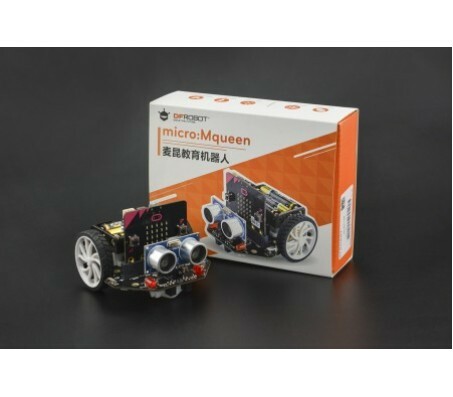 The Mini-body, interesting features and plug-and-play allow children to quickly learn graphic programming in entertaining, nurturing children's interest in science and logical thinking. Remind: Micro:bit board and batteries are not included. Support for Makecode, will support Scratch and python later. All-metal miniature gear motor, good quality, strong driving force. Line patrol, ambient light, LED lights, ultrasonic interface, buzzer, I2C interface, mechanical expansion screw hole, etc. ... full-featured, highly expandable. Exclusive customized POM bearing wheel, flexible and reliable, strong obstacle crossing ability.